Luska is an intimate space opera and a rich portrait of human society tens of thousands of years in the future, a singular blend of science and high drama with a large cast of characters from distinct cultures and languages where I draw upon my background in anthropology and passion for science to create a richly drawn universe. Lovers of intrigue, intricate yet intimate plots with non-traditional characters will be a fan of Luska. Sci-Fi fans, rejoice! 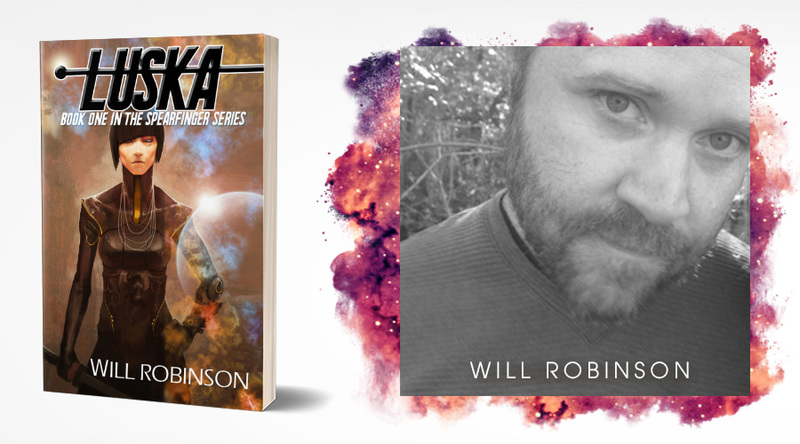 ‘Luska’ is an intensely rich space-opera with more than enough intrigue and action to sink your teeth into. 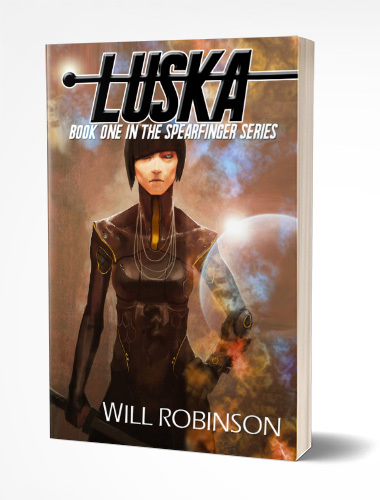 This story follows multiple perspectives across a vast array of intertwining storylines, all building up to Luska’s true threat: the showdown between the Spearfinger race, and the anti-alien, god-like Eth. The ramifications of their confrontation could decide the future of the galaxy– and the direction of humanity. Luska is very well written, Robinson has obviously poured many many hours of his life into crafting this piece, and it shows. Once I started to get my head around the terms, names, and general context of the universe, I found the different storylines engaging and interesting– particularly as someone who drools over complex worlds. There are some surprises hidden in ‘Luska’, fun twists and turns, and promises that set us up for books to come. I am only awarding ‘Luska’ two out of five stars because it is incredibly difficult to get into. And I mean, really difficult. You have to devote 100% of your attention to names, places, technologies, and piece it together yourself as you go. I’m typically a big fan of this, but even for me, I found the barrier to entry quite high. It’s a great read, however, it struggles to ‘hook’ the reader. ‘Luska’ reads as if it has been professionally edited, if there were any spelling or grammatical errors in Robinson’s text, I did not see them. I found all of the characters to be quite unique while swapping viewpoints I enjoyed the distinct personalities and how they reacted to the unique world around them. Oftentimes the dialogue is full of the world’s jargon, which can make it difficult to follow at first– but it does flow naturally. Overall, ‘Luska’ is an incredibly ambitious space-opera joy ride, chock full of much of what I love about sci-fi novels. You’ll truly travel to other worlds through the pages, and become immersed in a rich, proudly built world. I would recommend this novel to anyone who has the time, energy, and interest, to devote to a serious space-opera undertaking. When not drowning in coffee and writing his 500th best-selling query letter, Will likes to hike, fish, and ulcerate. He also enjoys trying to remember how to art and reads a lot of sci-fi, Amazon author bios, literary fiction, historical fiction, anthropology, science, history, Ikea instructions, and cereal boxes. His two works, Pathology Report and Kadru- The Imperial Forest are out now! Both are prequels to his full-length novel Luska which should be out in October 2017.